Starring Katherine Jenkins and Alfie Boe. 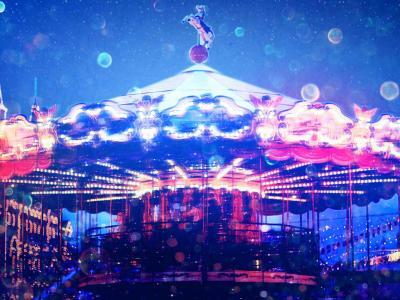 Rodgers & Hammerstein’s iconic musical Carousel came to the London Coliseum in 2017 in a semi-staged version, starring Katherine Jenkins and Alfie Boe. Fifteen years after getting caught up in an armed robbery and taking his own life, the charming carousel barker Billy Bigelow gets a chance to return to earth and make amends. Discovering that his daughter Louise has grown into a lonely, troubled teenager, haunted by her father’s legacy, Billy vows to restore pride to his family in the musical voted by Time as the greatest of the 20th Century. With much-loved classic songs ‘You’ll Never Walk Alone’, ‘If I Loved You’, ‘Mister Snow’ and ‘June is Bustin’ Out All Over’, Carousel delivered on its promise to delight and uplift. Lonny Price (Sweeney Todd: The Demon Barber of Fleet Street, Sunset Boulevard) returned to the Coliseum to direct a limited run of 41 performances. Based on the play Liliom by Ferenc Molnáras adapted by Benjamin F. Glaser.